The Bachelor’s degree program in Mortuary Science and Funeral Service is the ONLY one of its kind offered at a public university within the state of Illinois. Our program is accredited by the American Board of Funeral Service Education. Students graduating from our program meet the Illinois Department of Professional Regulation licensing requirements. SIU's Mortuary Science and Funeral Service degree is recognized by other state boards as well. 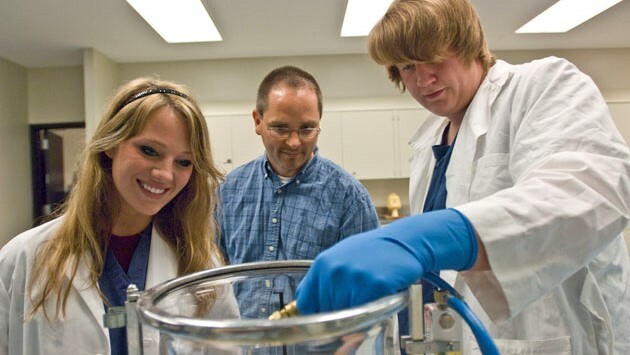 The Mortuary Science and Funeral Service program mission is to challenge students to achieve academic and professional excellence; prepare students for entry level positions in the funeral service profession; provide quality instruction in keeping with current trends in the profession; cultivate and maintain excellent relations with local, state, and national organizations; enhance university and community relations; and work toward the continued improvement of the Mortuary Science and Funeral Service program as an ongoing process. The Mortuary Science and Funeral Service Program is comprised of two tracks that both offer the Bachelor of Science degree. The first track is for the on-campus student that does not have an AAS in Mortuary Science and Funeral Service (Track I) and offers a traditional in-class delivery method. The second track (Track II) is offered to those students that have completed an ABFSE accredited program and have finished their AAS in Mortuary Science and Funeral Service. This delivery method of instruction is all offered via distance learning and offers those working in the field a completely online Bachelor of Science degree completion program. Providing a quality learning environment by maintaining high program standards and offer opportunities to network with individuals and entities within the profession. Offering students a challenging and rewarding academic curriculum to enable them to fulfill their potential in theory, practice and management of funeral service. Security and retaining faculty with experience in education and the funeral service field and providing them with opportunities to attend local, state, and national meetings; encouraging their membership and participation in funeral service organizations; assuring they add to the body of knowledge of funeral service literature. Contributing to the University's growth by developing, maintaining and participating in community activities. Assessing our degree requirements and the allocation of credit hours to ensure they are consistent and conform with the accreditation requirements of the American Board of Funeral Service Education. A quality baccalaureate level mortuary science and funeral service education for our students. An advanced educational pathway for associate degree or certificate graduates of mortuary science and funeral service programs. Advanced techniques, skills and knowledge for our students in areas benefiting the funeral service profession. The necessary skills that enable our graduates to plan, implement, and manage/own a funeral establishment. The professional services skills required by any state licensing board. Good preparation so that upon graduation our students may participate in the development and implementation of solutions in the health care area. The basic knowledge regarding compliance of laws at the state and federal levels, as well as with those of other regulatory agencies pertaining to funeral service practices, public health, and the profession. Solid preparation so our future funeral directors/embalmers have a strong background in social sciences, humanities, natural sciences, communication and mortuary sciences and/can ethically apply this knowledge in all situations. The sought-after funeral directors/embalmers to meet the employment needs of Southern Illinois, the state of Illinois and the country. Encouragement for our students to continue their professional growth through continuing education and research following graduation. - Table explains the national pass rates for students at Southern Illinois University Mortuary Science and Funeral Service program. First, you need to fill out the SIU admissions application. Complete and submit the Fall 2019 program application.